I’ve been thinking a lot about improving my recently started campaign over my earlier ones, and I discovered a new pair of approaches to campaign and adventure design. The Campaign of the PCs Career, and the Campaign of the PC’s greatest deeds. The former following all the characters explorations and fights, while the later one is limited to the highlights. Career-based campaigns where kind of the default in early RPGs and are still the default mainstream among oldschool fans. The PCs learn about a ruin or mysterious place and simply go checking it out to see if they find anything interesting or valuable. Pretty much all D&D adventure modules from the 70s and 80s follow this approach and the same principle scaled up is essentially what most sandbox campaigns are about. Sometimes amazing situations happen, but mostly it’s about looking for treasure or doing paid mercenary work. If the PCs perform a great deeds and legendary battles, it’s often almost by accident and you’ll neven know when it will happen. Almost all campaigns I’ve either ran or played in also followed this approach. Self contained jobs that provide XP and treasure, but no deeds of note. On the other end of the spectrum, things are rather different. Instead of asking “let’s go to that place and see what happens?”, the adventures start with a pretty good idea (at least for the GM, but sometimes also players) what the events will be about, but with the open question of “how will things happen?” Instead of going to explore a cave and discovering a dragon that might be fought or avoided, the party sets out to find the lair of a dragon and deal with the creature. This is an approach that had been very dominant over the last 10 years. And even though the adventure paths from Paizo are written to bring characters from 1st level to 15th, and in a way following each step of their adventuring caeer, they still use the approach of always remaining a series of big and important events. They generally don’t include dungeons or encounters that turn out to be unrelated to the villain or mystery the PCs are after. While the execution of adventures follows a spectrum from completely randomized free roaming to completely scripted plot, the first descision of the GM preparing a campaign is an almost binary one. Will it be a continuous development or a highlight reel? A common argument against highlight-based adventures is that they are predetermined and take away player choice. But such cases are not bad because they are partly scripted, but because they are overscripted. Even with a few predetermined elements, there can still be much room for player choice. In the example with the dragons lair, the players are only given the task of dealing with the dragon. In a truly bad adventure, the dragon sits in a room with only one entrance and will instantly attack when the PCs step through the door. And usually the PCs also have to fight a guardian in front of the door, who can not be bypassed and also attacks on sight. Such adventures are easy to write, but as I see them, overscripted. The premise of traveling to a dragons lair to put an end to the dragons attack can be used for much more. There can be multiple ways into the cave, requiring different skills and equipment, and there can be ways to ambush the dragon when it returns from a raid, prepare traps while he’s away, convince a minion or slave to betray the dragon, or even talk to the creature to come to an agreement. Still lots of relevant descisions to make and lots of choice. In a way, there is even more choice than in a plain megadungeon crawl, as there are objectives to perform instead of huting for XP and gp. 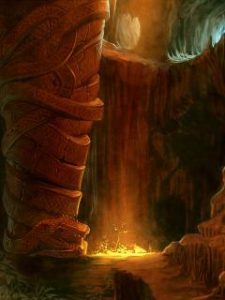 A quite well known example would be Steading of the Hill Giant Chief, which starts by putting the characters in front of a monster lair with the task of stopping the creatures from attacking villages. From there on you are free to do whatever you want, but you are also not just doing it to make your character stronger, but also perform an important deed that benefits the people of the game world and is something the PCs will be known for and can be boasting about. The best of both worlds. This small piece of literary analysis being said, I am personally a strong advocate of the “Story Now!” approach. In my campaign, the PCs have day jobs that usually don’t involve fights to the death and even though some of them are warriors who keep the land surrounding the village clear of dangerous beasts and outlaws, it doesn’t seem worth the effort to describe all or even some of the minor skirmishes that are their daily life. When we sit down for the game and get out the dice, it’s because we’re playing an event that is far from ordinary and a story worth telling. But neither the players, nor I, know how the story will turn out. But when I prepare an adventure, it’s my job to set up a situation that will result in something significant, whichever way it turns out. One of the parties great deeds. Or their greatest failures. And here we get to the actual purpose of this thread: What deeds are actually that important that they are worthy of being told in an highlight-episode of the PCs adventures? Interestingly, recovering a relic for a temple can work out exactly as finding an ingredient for a wizard or an artwork for a collector. However, the later ones are just jobs, while the former is a quest! Sometimes, it makes sense to have an adventure start as just a job, but that can be used as a cold opening to establish the situation before the real adventure begins. James Bond and Indiana Jones being well known examples.